TB Tours offers charter transportation for groups of any size with our 4 to 46 passenger vehicles. Our range of buses are available for charter 24 hours a day every day of the Year! 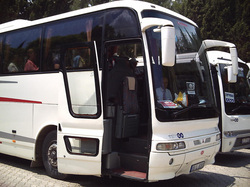 As a charter bus company, TB Tours has been serving throughout Turkey since 1963. We take pride in our well maintained fleet of clean, comfortable vans, minibuses, and motorcoaches. Find out for yourself why people throughout the world have put their trust in us for more than 48 years. With a fleet including variety sizes of vehicles, we will surely have the right bus to suit your group travel needs. - All of our vehicles are designed for comfort and reliability. - Each vehicle is equipped with the most modern communication equipment in order to keep in contact with our 24-hour dispatch operation. - The company provides monthly safety inspections of all its vehicles. Interiors and exteriors of the vehicles are cleaned on a daily basis. We guarantee to turn up before the scheduled departure time booked and will safely, and comfortably transport your group between your required locations. Contact us today for an obligation free quote and find out how we can move you!